The exudation of soluble carbon compounds from Zea mays roots was investigated over a 10 day growth period under sterile and non-sterile solution culture conditions. The results showed that plants grown in sterile static solution culture, where C was allowed to accumulate, released 8 times less C than plants grown under culture conditions in which the solutions were replaced daily. The increased C loss from plant cultures in which exudates were removed daily was attributable to, (a) the reduced potential for root re-sorption of previously lost C, and (b), increasing diffusion gradients between the root and the surrounding bathing solution increasing passive leakage of exudates from the roots. In treatments where C was removed daily from the root-bathing solution, 86% of the total C lost was of a soluble low molecular weight nature, whereas, in sterile and non-sterile static cultures, allowing the accumulation of C over 10 days, this was reduced to 67.5 and 48% respectively. The main C fluxes operating in a solution culture system (efflux and influx of C by both roots and microorganisms) were examined using a computer simulation model to describe movement of soluble sugar-C in both sterile and non-sterile conditions. In sterile static cultures where C was allowed to accumulate in solution over a 10 day growth period, 98% of the C exuded was re-absorbed by the plant. Where C was removed daily from the root-bathing solution this was reduced to 86%. The predicted patterns of C accumulation were similar to those found in the experiments. Simulations showed that the pattern of accumulation and final equilibrium concentrations were dependent on the rate of exudation, the spatial characteristics of exudation, solution volume, root growth rate and the presence of a microbial population. 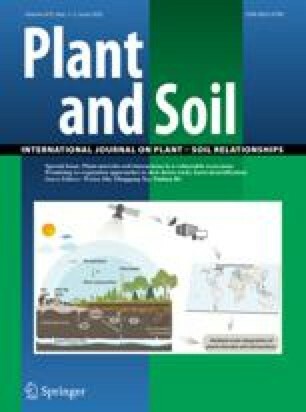 Simulations under non-sterile conditions showed that roots can compete with microorganisms for exudates in solution indicating the possible importance of re-sorption in a soil environment. The results clearly indicate that roots are capable of regulating the net amount of C released into a solution culture with the amount of C collected being highly dependent on the experimental conditions employed. The possible implications of soluble C influx on processes operating within the rhizosphere and in experimental systems is discussed.